Guy Edwards measures up to the other big guy. 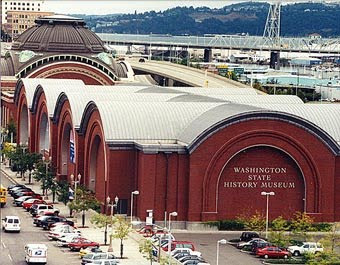 For the beginning of February, it was a remarkably Spring-like day yesterday when Guy Edwards and I headed up the interstate from Portland, Oregon to Tacoma, Washington. 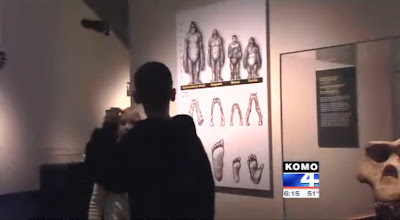 We were in search of Bigfoot and we found him right downtown in Tacoma at the Washington State History Museum. 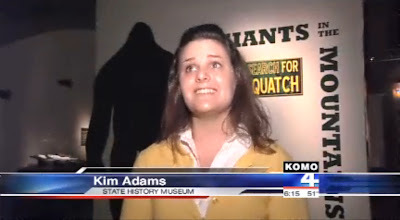 There to introduce us to the big guy was the welcoming and enthusiastic Gwen Perkins, the curator of the current exhibit, Giants in the Mountains: The Search for Bigfoot. She led us through the exhibit answering our questions and providing tidbits of information that didn’t make it into the show. 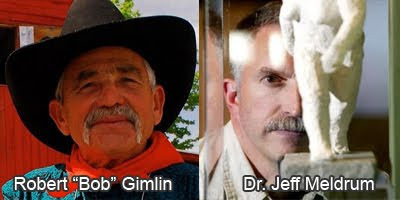 Giants in the Mountains is a comprehensive, yet intimate, sampling of the full range of the Bigfoot phenomenon, including Native American artifacts, plaster footprint casts, photographs, examples from popular culture, and much, much more. 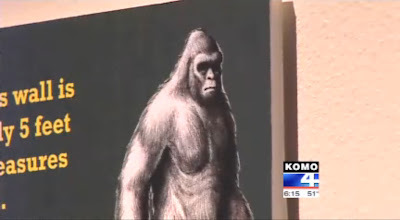 While not overwhelming in scope, the exhibit manages to include several of the iconic touchstones of Bigfoot lore. 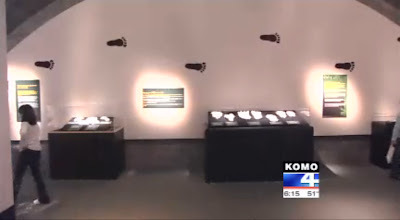 Most of the artifacts have come from the collections of either Dr. Grover Krantz or Dr. Jeff Meldrum. A few of the plaster casts are so much more detailed in real life than anyone can see in photographs of the same casts, that it’s hard to believe they’re the same objects. Seeing the actual casts makes a much bigger impression when they’re only inches away from your nose. 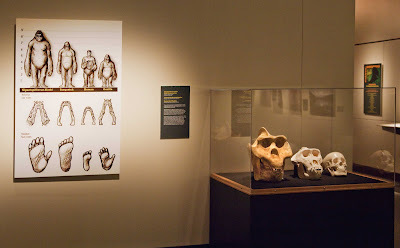 A special treat was seeing Dr. Grover Krantz’ Gigantopithecus skull reconstruction. A surprise was the ancient Native American stone carvings of animal heads that carry suspiciously apelike characteristics. 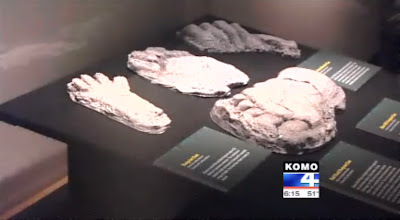 If you are headed towards Tacoma, Washington, or need an excuse for a road trip, be sure to check out Giants in the Mountains: The Search for Bigfoot at the Washington State History Museum. It’s well worth seeing. 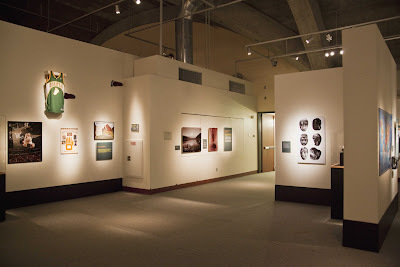 The exhibit is up until June 27th. 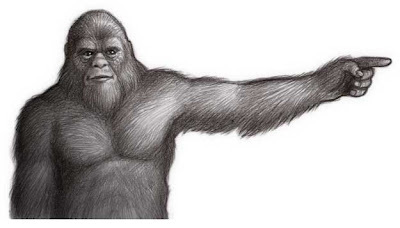 Comparison of the relative sizes of Gigantopithecus, Sasquatch, Human, and Lowland Gorilla, with replica skulls of Gigantopithecus, Lowland Gorilla, and Human. 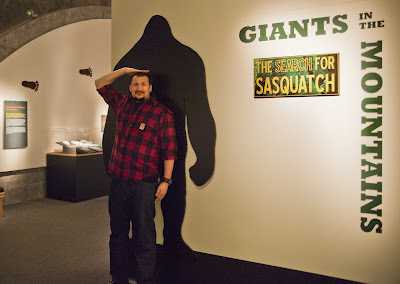 The exhibit, Giants in the Mountains: The Search for Bigfoot at the Washington State History Museum.